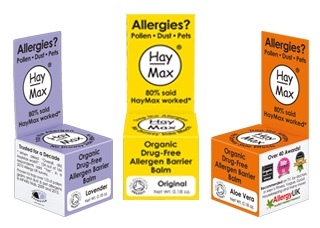 I was recently sent 3 containers of Hay Max Allergen Barrier Balm to try out this allergy season. They arrived at the perfect time because it seems that this allergy season has been worse than the last. Hay Max allergy balm is an organic drug free balm that you rub underneath your nose that prevents the allergens from going up into your nasal passages. There are 3 different “scents”, one is original and the other 2 are Lavender and Aloe Vera. I liked all of them but I found that the lavender one was ideal for night time. It had a relaxing scent that my kids also liked. Hay Max helped keep out dust and pollen from being breathed in our nose. It also didn’t have any side effects. If you are looking for something extra to help with your allergies especially for people who have really bad allergies this is a good product to use that won’t interfere with any other medications that your already on. I think it gives an extra edge to help with your allergies. You can get Hay Max directly from their website at haymax.biz In the U.S. visit haymax.us to order. They come in small containers but each container can last you all season. It’s also safe for children and pregnant woman. HayMaxTM is made from a blend of beeswax and sunflower oil to which we add aloe vera leaf juice extracts or essential oils to create four different varieties of Allergen Barrier Balm. HayMax Pure: Beeswax, sunflower oil. HayMax Aloe Vera: Beeswax, sunflower oil, aloe vera. HayMax Lavender: Beeswax, sunflower oil, lavender essential oil. HayMax Frankincense: Beeswax, sunflower oil, frankincense essential oil. How To Ease Your Child’s Allergy Symptoms. So what can parents do to help their children manage hay fever symptoms? Quite a lot, fortunately. Here are some ideas. Take your child to the GP, to get a proper diagnosis. If the symptoms occur only in high summer on hot, sunny days, it’s almost certainly hay fever. But it could be any of a number of other allergies and treatment might differ in each case – although there is evidence to show that organic pollen blocker HayMax applied to the base of their nostrils (where the air comes in) should work for all airborne allergens. This creates a protective layer between their eyes and the pollen-laden atmosphere, and can reduce symptoms considerably. It also relaxes their eyes, which relaxes them. Pollen grains come indoors borne on the air and stick to bedding, so frequent washing, covering the bed with a sheet which is carefully folded & stored away from the bed during the night, before they get into bed, and turning pillows just before they get in, can all help reduce symptoms. Limit their exposure to pollen during peak periods. Pollen is released early in the morning and travels upwards as the air warms up. In the evening, as the air cools, it moves back down again. Symptoms are usually worst during the early morning and evening, when the pollen grains reach nose height, so try to keep children indoors at these times. Make HayMax part of the bedtime routine. Apply immediately after washing/showering and before going to bed. Leave a pot by their bed so they can re-apply as needed. In independent studies* HayMax has been shown to trap over a third of the pollen before it gets into the body: less pollen, less reaction. As with many other things, prevention is better than cure! You can visit their website for ordering and more information.They also have recipes on there that can help your allergies.